I’ve been an advocate on insoles ever since I first sold shoes at Champs Sports (1998). Back then, I thought it was just some way of increasing our sales numbers. Now, having run two marathons and working for a real running store, I’ve learned that it’s much more than numbers. My feet are trouble. I am a severe over-pronator (my ankles roll in and my toes point out). Most people pronate, so I’m not THAT freakish, but I digress. 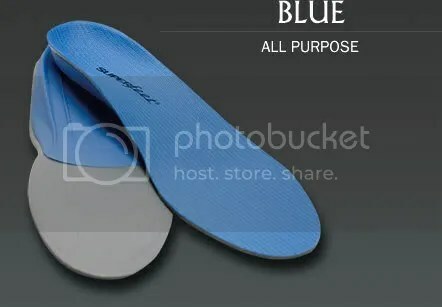 Like many people, I can’t afford orthotics ($200-$500), so I purchased Sole insoles. They’ve worked great, but I want to explore other options. Today I got a pair of Superfeet Blue. I will wear them for couple of days and get used to them. Then I will run the six miler in my new insoles. For the record, my podiatrist recommended these insoles, so it has to be worth a shot. This weekend, I will report back on the new insoles as well as Accel Gel (see the post below this). its looks nice and better…. the arch support is important.